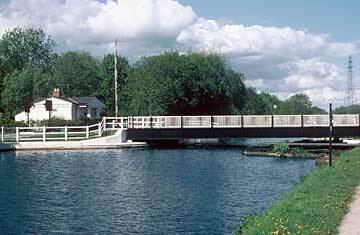 The canal linking Gloucester and Sharpness docks is often said to be 16 miles long, 16ft deep and to have 16 bridges. In fact it was intended to be 18ft deep in the centre to accommodate the keels of large sailing ships, but it was not dredged to the full depth because in later years steamers had flatter bottoms and the under-water curvature of the bridge-holes became limiting. There were originally 16 bridges across the canal and one across Gloucester Lock. Four railway bridges were added later, two at Sharpness also being road bridges. Two road and two rail bridges have been removed, but new road bridges were added in 2007 and 2008, and so the total is currently 18 across the canal and one across Gloucester Lock. The old wooden bridges have all been replaced by single-span steel bridges operated by one man. Most of these are opened by the bridgeman turning a handle, but some (such as the new Fretherne Bridge above) are powered by electric motors. Sadly, the graceful arch of the wooden bridge has not been replicated. Eight of the bridges have classical-style bridgemen's houses nearby. These were built in the 1840s when competition from the railways made it important to have men on hand to open the bridges at night so that vessels could meet the tides at Sharpness. 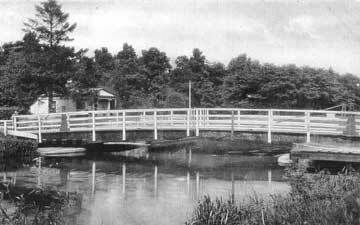 At that time, the other bridgemen lived in existing houses that were close enough to their bridges. 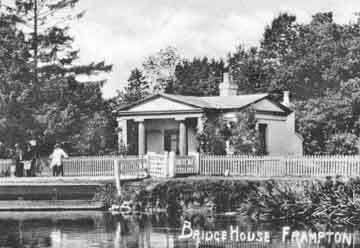 Most of the houses are now in private ownership and are not occupied by current bridgemen. In later years, the houses have been extended to provide more accommodation and modern facilities. 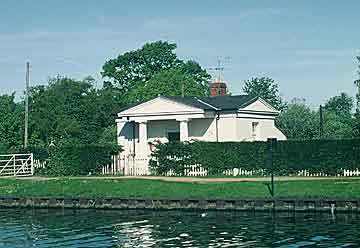 From the canal, however, Fretherne Bridge House has hardly changed, as the alterations have been confined to the basement and the rear. Vessels were originally towed along the canal by horses, but their use declined after steam tugs were introduced in 1860. The towpath is nominally open for walkers and cyclists along the whole length, but there are occasional stoppages which are noted on the Access page. Most of the original mileposts are still in-situ, showing distances from Gloucester and from Sharpness, and missing ones have been replaced. There are also many white checking posts along the towpath, intended for taking a check-rope when necessary to correct the course of a vessel in the narrow channel.